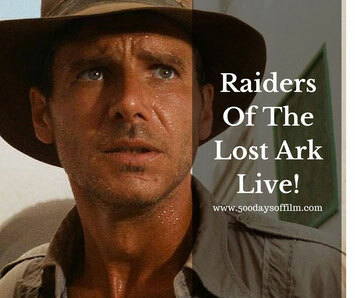 Raiders Of The Lost Ark Live! Raiders Of The Lost Ark turns 35 years old this year and what better way to celebrate than with a screening of this classic film at the Royal Albert Hall accompanied by a live orchestra? Raiders sees archaeology professor and action hero, Indiana Jones (Harrison Ford), racing against time to find the legendary Ark of the Covenant before a group of Nazis get their hands on this powerful ancient relic. Teaming up with his feisty, hard drinking ex, Marion Ravenwood (Karen Allen), and good friend Sallah (John Rhys-Davies), this quest put Indy's expertise and endurance to the test. Steven Spielberg's action adventure won five Oscars* in 1982 and is often found at the top of best loved and most critically acclaimed movie lists (Empire placed Raiders at number two in its list of the greatest movies ever made, second only to The Godfather). The one Oscar that Raiders Of The Lost Ark surely should have won was for John Williams’ Best Music (original score). Okay, Vangelis’ Chariots Of Fire is also rather iconic but, for me, it is Williams all the way. Raiders Of The Lost Ark Live was accompanied by the wonderful 21st Century Orchestra and conducted by its founder, Ludwig Wicki. The event marks the first time a complete Williams score has been played at the Royal Albert Hall. Click Here For More Film Reviews, News And Cinema Events! You don't need me to tell you that Raiders Of The Lost Ark is a classic film. 35 years on and it is still a hugely enjoyable and entertaining film. This movie is, of course, the first in the massively successful and enduring Indiana Jones series**. Having watched all five Indy movies many, many times over the years, I sometimes forget which iconic set pieces take place in what films. However, I then remember that most occur in the original - the rolling boulder, Marion’s drinking games, the snakes, the monkey (bad dates! ), the moment when Indy climbs underneath a speeding truck and, of course, that really rather horrific ending. It was just wonderful to see Raiders Of The Lost Ark again on the big screen - and, with dimensions of 20 meters by 8.5 meters, boy what a screen. I have been lucky enough to attend quite a few events at the fabulous Royal Albert Hall and it never ceases to take my breath away. Walking to our seats, I was overwhelmed (and completely big kid thrilled) by the size of the cinema screen. That feeling only increased with the arrival of the 21st Century Orchestra and composer Ludwig Wicki. Looking around, I could see that I was not the only one who felt excited. There were people of all ages in the audience - many wearing Indy hats and movie-themed t-shirts. It was amazing to be among so many people (the venue was absolutely packed with many people standing in the Gallery) who love this film - and film music generally - as much as I do. I really appreciated how much this film meant to the audience in the Royal Albert Hall when Indy uttered his famous line: “It’s not the years honey, it’s the mileage”. There was a collective ripple of laughter and the love felt for this film was palpable. The concept of watching a classic film with a live orchestra makes for an extremely special cinema experience. The Royal Albert Hall has certainly hit on a winning formula here (I am coming back in November to see Jurassic Park Live!). However, these screenings do need to feel special as they are certainly not cheap. I had a wonderful view in the stalls (in front of the screen) and for that I paid £60 for my ticket. Pretty pricey but, for me, it was well worth it - for the film, the orchestra and the venue. When Raiders Of The Lost Ark started, English subtitles appeared on the screen. Confused, I thought that perhaps the beginning (the bit with Alfred Molina) featured some foreign language scenes. I soon realised that the actors were speaking English and that the subtitles were there to help me understand the dialogue over the sound of the orchestra. I did need the subtitles at various times throughout the film. While there has been some criticism of the audio quality at this event, this in no way impeded my enjoyment. After all, more than anything, I wanted to hear the orchestra. Raiders Of The Lost Ark Live is the first film that I have seen accompanied by a live orchestra. At first, I didn’t know what to look at - the musicians or the movie itself. I was also fascinated by how Ludwig Wicki kept in perfect time with the action. While the orchestra had their backs to the screen, Wicki had a small screen in front of him showing both the film and a series of moving lines and flashing dots to enable him to keep in time (via timecode synced video playback technology). Then, as the film progressed, I had moments when I almost forgot that I was in a room with a live orchestra. This was testament to how seamless the entire event felt. Raiders Of The Lost Ark Live was a wonderful movie experience. I would highly recommend the Royal Albert Hall’s accompanied cinema - this is event cinema at its best. Raiders Of The Lost Ark's cinematographer, Douglas Slocombe sadly died in February 2016 aged 103. *Raiders Of The Lost Ark won five Oscars in 1982 for Best Art Direction; Set Decoration, a Special Achievement Award (Sound Effects Editing), Best Sound, Best Film Editing and Best Visual Effects. It was also nominated in the Best Picture, Best Director, Best Cinematography, and Best Music (Original Score) categories. The 21st Century Orchestra was created in 1999 by Ludwig Wicki. The orchestra performs live concerts featuring soundtracks written by notable composers for major motion picture productions. Do you love Raiders Of The Lost Ark as much as me? Have you, or do you plan to attend one of the Royal Albert Hall’s accompanied cinema events?